Through sunny, clear weather we flew over mountainous, Northern China into the great Gobi Desert of Southern Mongolia. Art tried to nap, but was interrupted by my never-ending questions and curiosity about the geography beneath us. It didn’t take long for him to join me in imagining our upcoming camel trek through the desert beneath us. 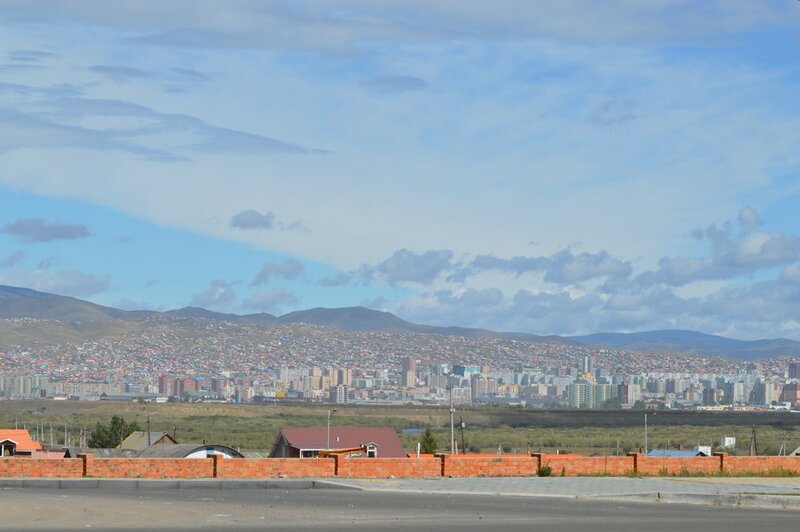 As our flight neared Ulaanbaatar, continuing north with the desert now behind us, we glimpsed the famous grassy steppes of Mongolia and then, rolling hills and mountains as we neared the capital city. 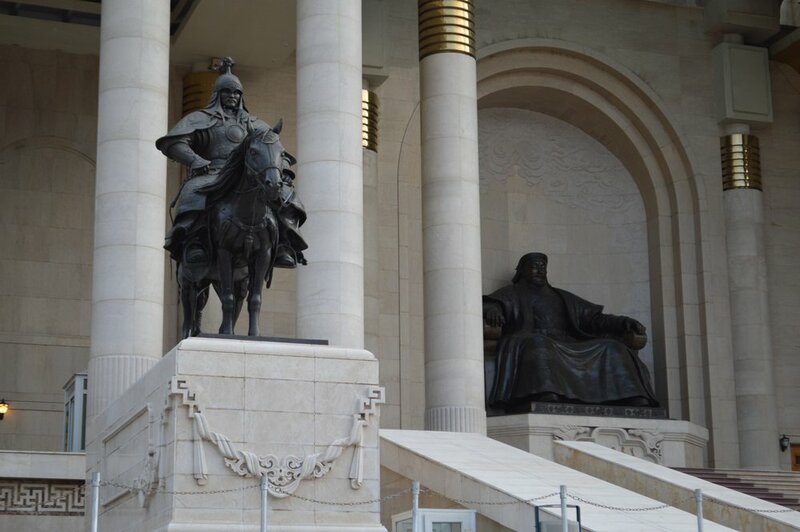 Although we have traveled to many countries in various parts of the world, we were particularly eager to see Mongolia. One of the world’s greatest conquerors was Genghis Khan, whose Mongol empire is still unrivaled as the largest contiguous land empire in world history. Today, the descendants of the great Mongol warrior armies continue the lives they knew long before Genghis Khan and his empire, as quiet pastoral nomads. Mongolia is the most sparsely populated sovereign nation in the world with more horses than people. 45% of its population lives in the capital city while another majority roam the deserts, steppes and mountains with their herds, living as nomads in their small circus tent like homes (gers). Our arrival into the Chinggis Khan International Airport was more pleasant and efficient than we had anticipated. We breezed seamlessly through customs and quickly reached baggage claim to find all of our pieces of luggage had arrived. As we rolled our luggage out of baggage claim we instantly found our driver waiting for us. I exclaimed, “It’s a Mongolian miracle! 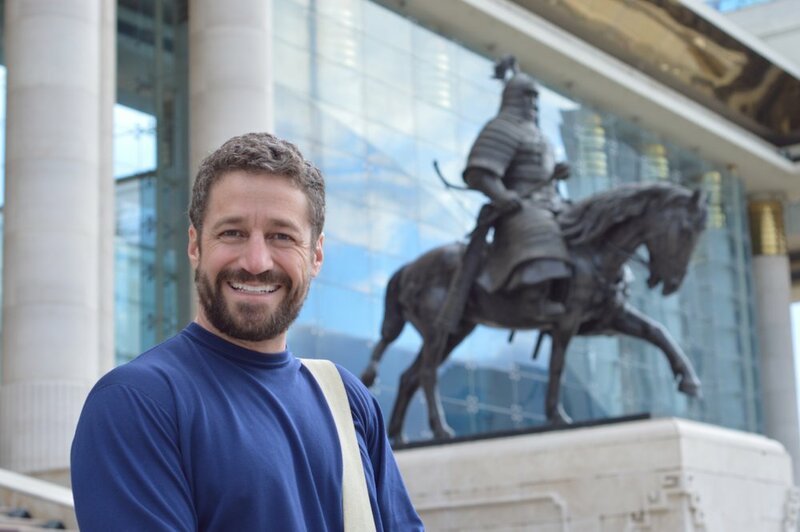 !” (A ten minute journey from deplaning to hopping in a car headed for the hotel, with all of our luggage intact is nothing short of an international travel miracle in my book!) We rode through the streets with windows down inhaling the aroma of fried, doughy goodness that seemed to follow us the entire 30 minute car ride, to our hotel, in the city center. I have yet to find the exact source of this intoxicating smell, but I suspect it is a popular fried meat-stuffed pastry called “khuushuur” that a very nice Mongolian-American woman on our flight told us we must try. Our initial ride from the airport also revealed colorful, rectangular homes and round yurts (“gers” in Mongolian) surrounded by perfectly squared fences dotting the grassy hillsides. This view then transitioned to colorful congested buildings in the center city. 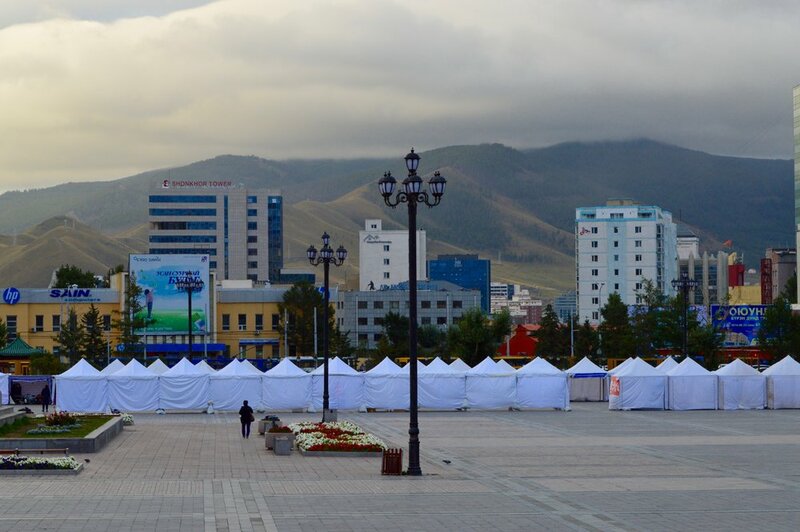 We scheduled an initial few days in the capital to rest and plan our longer journey around rural Mongolia. We skipped many of the tourist activities in the city, and instead, wandered about collecting last minute supplies for our trek and stopped at cafes along the way to people watch. 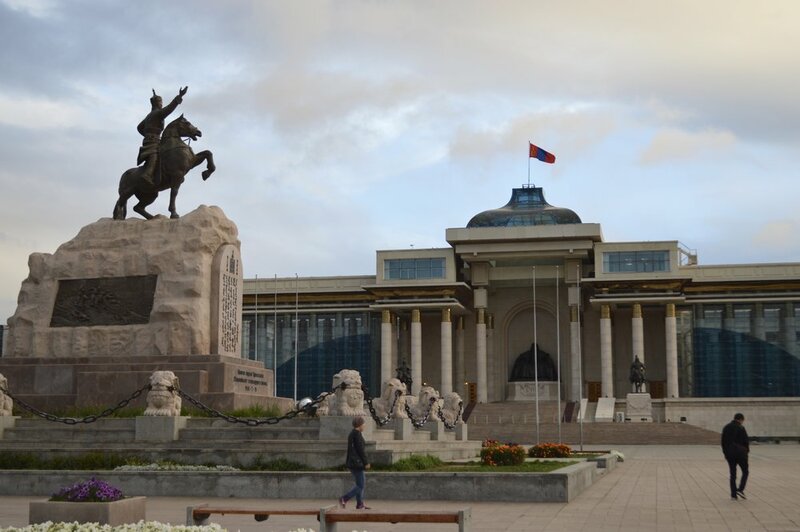 The capital city of Ulaanbaatar is unlike anything we expected in this ancient land. Anticipating a city void of American and European luxuries and shops, we were pleasantly surprised by the urban landscape. There are dozens of coffee shops, bakeries and cafes that reminded us of the ones back home. There are western stores like Yves Rocher, Sisley, and Mango. 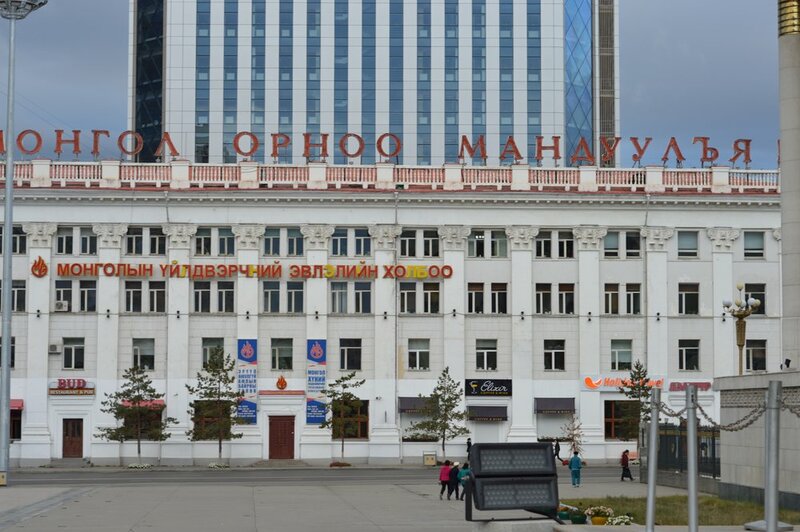 The presence of such stores becomes less surprising the more time you spend watching people on the streets of Ulaanbaatar. Nearly everyone is well-dressed and has put considerable effort in looking their best outside the house. The women, in particular, seem like they wouldn’t be caught on the city streets without flawless makeup, polished nails, and their cutest outfits. The men love “athleisure wear” and are decked out in the likes of Nike and Adidas. 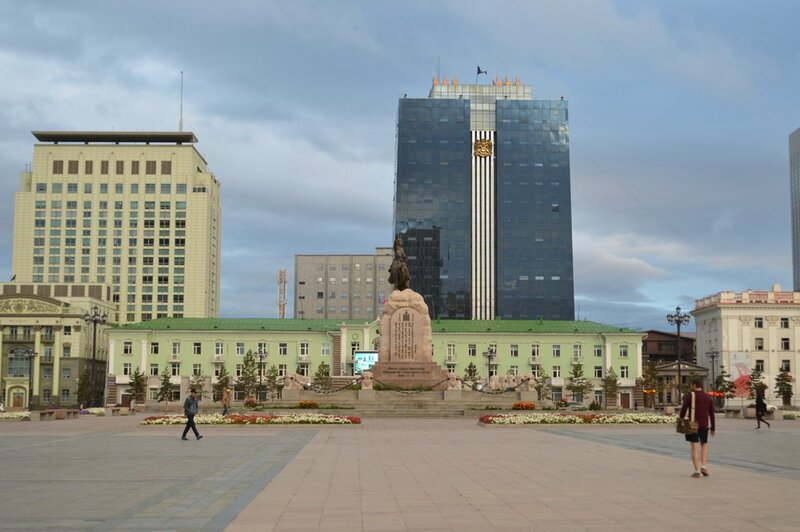 The urban population of the largest city, by far, in Mongolia, seems worlds apart from the nomadic culture. In addition to observing how people were dressed, we couldn’t help but notice the vehicles clogging the streets of the very dusty and somewhat polluted city. Although, we did see many affordable compact European and Japanese cars whizz by, we observed more Mercedes G-Wagens than I have ever seen in my life, in one city. Having spent time in various cities from Dallas to Dubai (these two cities in particular considered, by us, as meccas for their concentrations of new, flashy cars) and after living in Germany (the home of these beasts) we couldn’t make sense of this G-Wagen craze. Finally, we asked our hotel proprietor who simply responded, “a Mongolian man is supposed to have a good horse.” The Mongol warriors became famous in history for their unrivaled equine skills, the true quote being “A Mongol without a horse is like a bird without wings.” In the modern urban capital, Mongolian men consider a G-Wagen to be the best figurative ‘horse’ they could own. We were told that the only country that purchases more G-Wagens than Mongolia is the UAE. I’ll have to fact check that, but from the number of them we saw on the streets, it seems quite true. We wanted to try Mongolian food, but were told that we would be sampling so much native food over the next month in our rural wanderings it would be in our best interest to enjoy something else in the city. We decided on a North Korean restaurant for one meal and Art had Mongolian dumplings and mutton soup for another. Our experience at the North Korean restaurant deserves its own post, so I’ll save that for later! 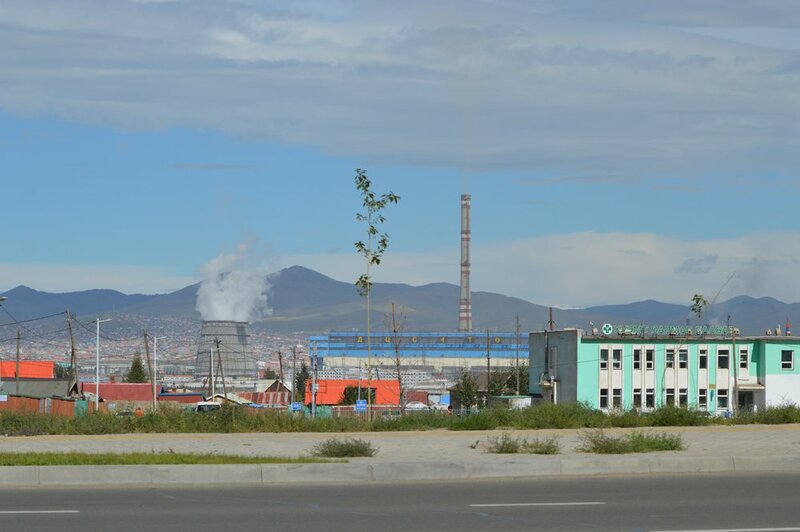 Overall, we really enjoyed Ulaanbaatar and plan to see more of the city when we return from our travels around the rest of Mongolia! willing to navigate is a guide to travel and adventure from a duo who are willing to navigate the world. We hope to share stories from all corners of the globe and tips on how to make your next adventure to these places a great one!